I can help you get the thorns out of life, and stop the hurt. Call today for a complimentary consultation and find out how you can THRIVE again. Hypnosis is a proven way to quit smoking, save money, and overcome tobacco. I help men, women, adults and teens lose weight the natural and effective way. THRIVE again! Control stress and anxiety at every level. Hypnosis is a natural solution with healthy side effects! Feel laser sharp in every area of life. Focus better and get more done! The word hypnosis comes from the Greek word for “sleep”. It is a natural solution to sleeping problems. Improive memory, reacall, and do better on exams. Manage anxiety and achieve goals. Research shows, both chronic and acute pain can be managed through hypnosis. Specific solutions for emotions, behaviors, and social interactions. From nail biting to thumb sucking, and evey other intrusive habit, hypnosis changes habits. Recovery from injury, in both mind and body. Heal faster and stronger. Develop confidence in relationships, at work, in public speaking or anywhere. Get in the zone and discover peach performance hypnosis, the same edge Olympians are using. …And much more, just ask! Amazing experience and very professional. I was completely at ease. Absolutely amazing! I wasn’t sure what to expect, but Jules made me feel at ease and explained the process. I highly recommend her for both smoking cessation and stress management. I feel very grateful to Jules. My chronic back pain is GONE and I am exercising again. Hypnosis, also referred to as Hypnotherapy or Hypnotic Suggestion, is a natural trance-like state in which you have heightened focus and concentration. Hypnosis is usually done with the help of a qualified hypnotherapist using verbal repetition and mental images. When you’re in hypnosis, you feel calm and relaxed, almost as if drifting into a dream-like state, outside distractions fade away, and you are more receptive to positive suggestions. 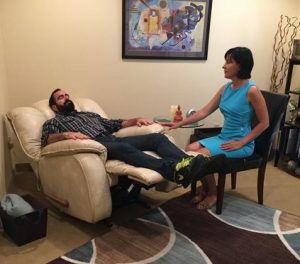 In hypnosis, you can rapidly make beneficial changes and develop effective coping skills regarding your thoughts, habits, behaviors, or psychological state. It’s important to know that although you’re more open and receptive to suggestion during hypnosis, you don’t lose control over your behavior. During hypnosis, there is a change in the brain wave activity, similar to that time just before sleep when the alpha state is entered. Your brain’s waking state is a beta brain wave, just as you are going to sleep it changes to alphaand then to theta and then to delta in sleep. The alpha and theta states are very dreamy, pleasant states. During these states the mind is very open to visualizations and creating a rich sensory experience. The more real the experience becomes in the subconscious mind during these states, the more effect it will have on your waking behavior. If you are not sure you can be hypnotized, just know that you already have been! Not only do you pass through a trance state every time you fall asleep and wake up, as described above, but you’ve been in a trance if you’ve ever been absorbed in a great film, lost in a good book, or swept up in a symphony. You’ve been in a trance if you’ve ever stared in fascination at a sunset or a passing cloud. You’ve also experienced a trance state if you’ve ever missed your exit on the freeway because you were thinking deeply or daydreaming about something else. Just how did you pass the last four freeway exits without even noticing? Road Hypnosis! It happens all the time.